More than 130 Grand Canyon University students attended the recent “Hire GCU Grads” internal job fair, and 16 were hired in various positions across GCU’s campuses. Jacqueline Smith, director of career services, said she hopes the number continues to rise. The second annual event was for graduating seniors, offering resume reviews, professional headshots and interviews for various full-time positions. But GCU’s commitment to helping those seniors find jobs doesn’t stop there. The external employment outlook for GCU graduates also is strong, said Smith, who was interviewed, along with University President and CEO Brian Mueller, by KTVK-Channel 3 for a story that aired on Friday, April 25. “We’re anticipating around 90 percent of our business grads being placed within six months of graduation, so we’re very excited about that,” Mueller said. According to the National Association of Colleges and Employers, 8.6 percent more graduates will be hired this year compared to 2013, with careers in accounting, business and engineering leading the way. 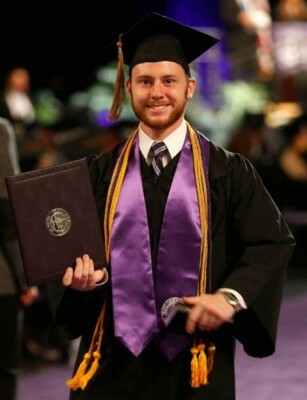 Lance Rao, a member of GCU’s Class of 2014, already has a job in his field, business. To view the Channel 3 report, click here. Recently hired grads Cat Lena and Kayley Winters are eager to continue their tenure as Lopes. “I’m excited that I get to further my education while I stay close to all the (soccer) players I know,” said Lena, 22, a goalkeeper for the women’s soccer team who earned a B.S. in health care administration. She was hired to a full-time position in GCU’s technical support department and plans to enroll in a master’s program next fall. “(Graduating) is scary — it’s a big change,” said Winters, 22, who earned a B.S. in business administration and will work as a marketing coordinator at the 27th Avenue Office Center.